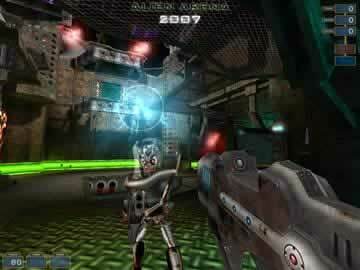 Alien Arena Game - Download and Play Free Version! Do you love rich, colorful, arcadelike atmospheres with a retro Sci-Fi twist? If so then you're going to love the frantic action Alien Arena has in store for you. 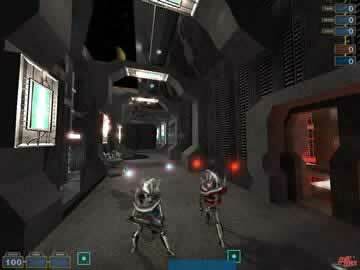 This first-person shooter combines some of the best elements of games like Quake III and Unreal Tournament and wraps it all with a retro alien theme, while adding plenty of original ideas to make quite a unique gaming experience. Whether it's taking on computer controlled bots in the single player arenas or facing tough human opponents on-line, you'll find hours of enjoyable action as you utilize a wide array of weapons, power-ups, and vehicles. Since Alien Arena is based off of some of the most popular first-person shooters, any fan of this genre will have no trouble picking it up and joining in on the fun almost instantly. The weapon set has its own unique aspects, such as your basic gun which has a slow powerful shot or an alternate rapid fire setting, and there are a wide variety of power-ups you can pick up, like one which temporarily gives you quad damage. You'll also get to test out your strategies in the huge assortment of levels which are available. Play any one of the various game types including Deathmatch, Capture the Flag, All Out Assault, Team Core Assault, Duel, and Cattle Prod. Develop your own strategies and learn the level layouts with the single players arenas while facing off against the rather difficult computer bots, and then test these schemes out against the huge Alien Arena community. Hone your teamwork skills with such modes as Team Core Assault, where players must work together to disable their enemy's central metal spider, and test you dexterity with the ferocious battles. If you like first-person shooters that have the perfect mix of futuristic technology and retro sci-fi, download Alien Arena today! 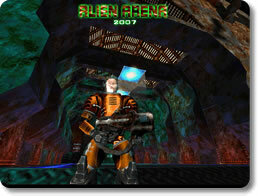 Check out some of the fps action in Alien Arena.